Say what you will about holiday madness — the glitz, the hype, the hysterical shoppers, several dozen competing productions of The Nutcracker — but there’s no denying the appeal of holiday music. No seasonal trauma is so great that it can’t be alleviated by a warm fire, a warmer companion and a soulful interpretation of “Silent Night” or “I’ll Be Home for Christmas” by the likes of Oscar Peterson or Dave Brubeck. Those gentleman, of course, are the talents of Christmas Past: Their holiday CDs are established treasures at this point. I’m concerned today with the talents of Christmas Present, and — as has been the case in recent years — the pickings are mighty impressive. Time was, you couldn’t find any of this stuff until well into December, and it would be smooshed together into a single — frequently unlabeled — bin toward the back of most music stores. These days, the “Christmas Music” section appears in mid-November and often stretches for an entire row, with sub-headings for Pop, Country, Jazz, Spiritual and New Age. Preparing for a round-up of this sort naturally demands that the dedicated listener — that would be me — pops the new releases onto the CD player several weeks before Thanksgiving, while praying that nobody else (except the patient and long-suffering spouse) notices. But I figure if the artists can record this stuff in mid-summer, as often occurs, then it’s no less bizarre for me to accelerate the season a bit by playing it a fortnight or two early. Not that long ago, the albums in my holiday jazz collection could have been counted on the fingers of both hands. These days, I’m lucky if 10 fingers are enough to catalog the number of new entries per year. Jazz covers of familiar Christmas songs have become one of the music medium’s growth industries, but increased quantity does not — alas! — guarantee increased quality. Even so, several of the 1998 releases quickly rose to the top of my must-play list, and Christmas with the George Shearing Quintet (Telarc CD-83438) immediately comes to mind. You can’t beat Shearing’s gentle touch on piano, and he’s ably assisted by Reg Schwager (guitar), Don Thompson (vibraphone), Neil Swainson (bass) and Dennis Mackrel (drums). 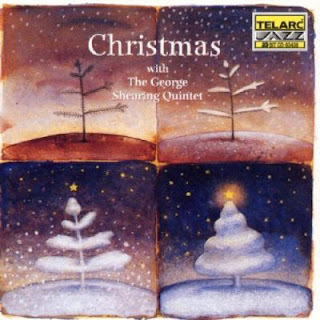 Shearing’s approach to these familiar tunes is playful: His rendition of “Have Yourself a Merry Little Christmas” includes a prominent “Birdland” riff, and “God Rest Ye Merry, Gentlemen” is played against the familiar 5/4 “Take Five” bass-line beat. Such minor quibbles aside, this is a tasty little album. You won’t embarrass yourself with this on the player, no matter who shows up for dinner.